Thought I would start a new photo thread on the Esterbrook J and Pastel Series pens! This is an Esterbrook CH-Series Tempo Red pastel purse pen, c. 1950s. This 4 3/8 inch long lever-fill fountain pen was part of the second generation colors of the Pastel pens and used a soft plastic that was prone to cracking. These pens have colored cap and barrel jewels. These Esterbrook pens can use the many screw-in Esterbrook nib units. This one came with a number 2668, Firm Medium stainless steel nib. Edited by PenHero, 16 April 2019 - 13:43. Thank you for posting the photo of that beautiful red Esterbrook. My favorite pen AND color. Thanks! It was something we found in a large collection of Esties! This is an Esterbrook J-Series fountain pen in Copper c. 1949-1951. 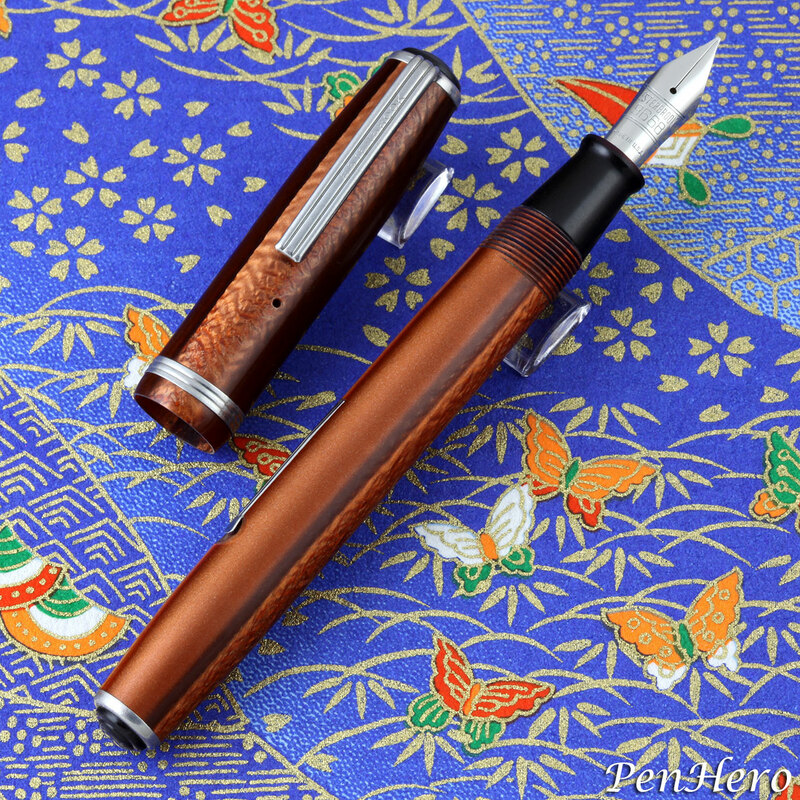 This 5 inch long lever-fill fountain pen was the standard size pen with black plastic cap top and barrel end jewels. The 1952 catalog lists Black, Green, Gray, Blue, Brown and Red. These Esterbrook pens can use the many screw-in Esterbrook Renew Point nib units. In 1952, Model J pens retailed for $1.95 without a nib, $2.30 with a Durachrome Series 1000 or 2000 nib and $2.80 with a Master Series 9000 nib. Master Series nibs are tipped. This one came with a number 9668 Firm Medium nib. 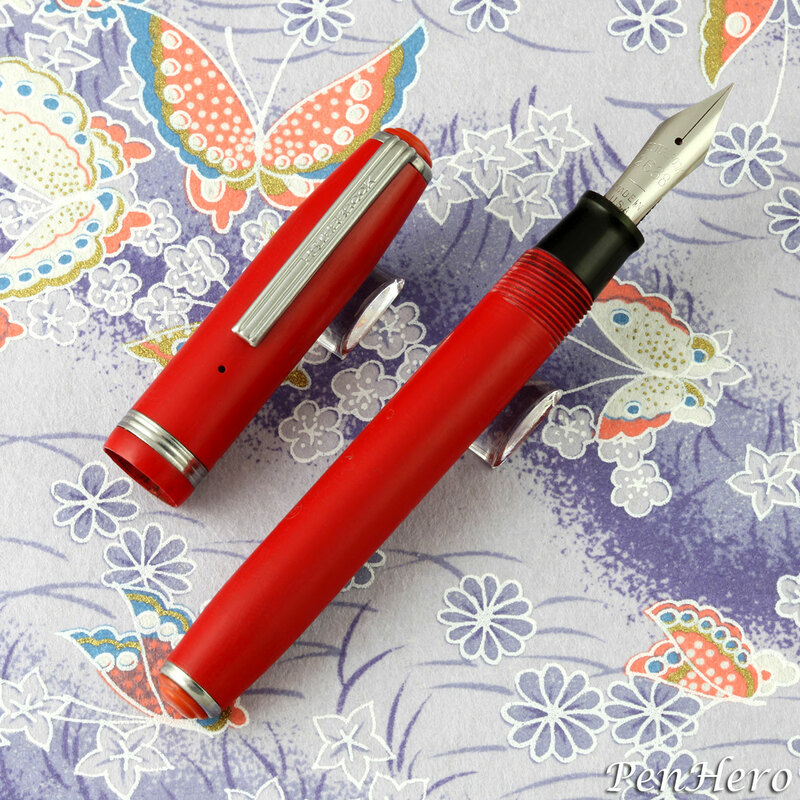 This is an Esterbrook SJ-Series fountain pen in Red c. late 1950s. This 5 1/16 inch long lever-fill fountain pen was the slender size pen with black plastic cap top and barrel end jewels. The striped pattern resin is often called "icicle" by collectors. The lever has a spoon ended shape, which can be seen in Esterbrook ads from 1956 and 1957. 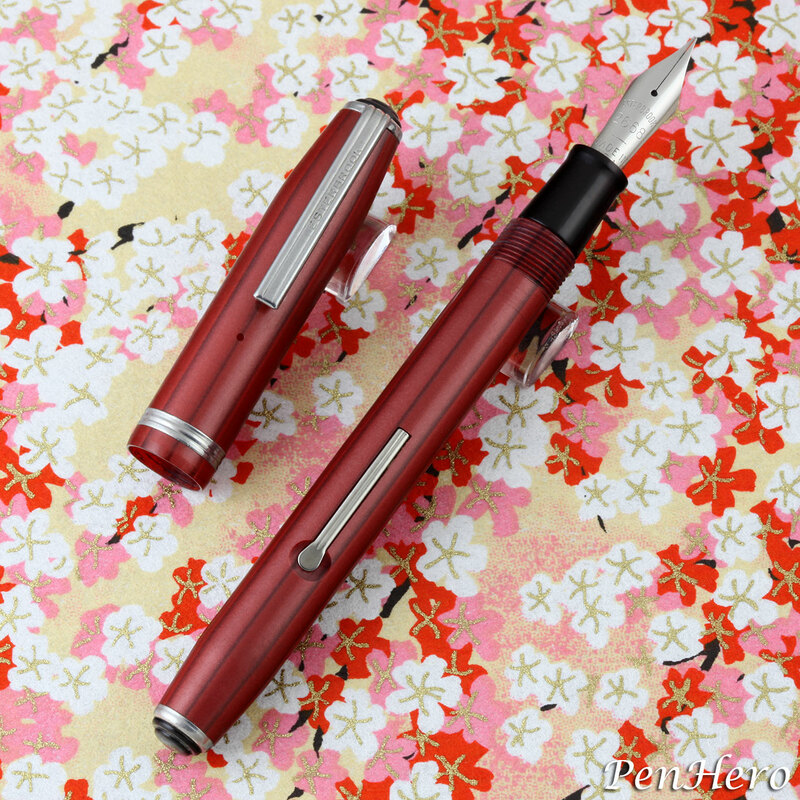 This one came with a number 2668 Firm Medium nib.